Part of a series honoring the late author and blogger Bill Crider. The Coyote Connection, by Bill Crider and Jack Davis writing under the “house name” Nick Carter (Ace Charter, 1981). Cover illustration by George Gross, whose art also appeared on several other Nick Carter adventures, including this one. I launched The Rap Sheet’s “PaperBack” series one year ago today. Actually, I adopted it from Bill Crider’s long-running blog, where it had been a popular feature since at least the fall of 2010. At the time of its debut here, Crider—the 76-year-old author of a humor-tinged mystery series starring Sheriff Dan Rhodes—had recently gone into hospice care at his home in Alvin, Texas, for what he described as a “very aggressive” form of prostate cancer. When introducing the “PaperBack” series to The Rap Sheet, I wrote that I intended it to be “my small way of extending his legacy.” I had no idea Crider would pass away just two days later, on February 12, 2018. In The Rap Sheet’s first “PaperBack” entry, I confided, “I don’t know how long this project will continue, and I will not be posting these façades on a daily basis (as Crider did), but I’ve given myself a full year to experiment with this idea.” Well, those 12 months have now run their course, and my experience with continuing the series has been nothing short of delightful. I haven’t received as many responses to my work as Crider won (likely because I have nowhere near as many friends and fans as he could claim), but it’s given me joy to know that a bit of Bill lives on here. (Left) A 1982 French edition of The Coyote Connection, published by Presses de la Cité, with cover art by Loris. 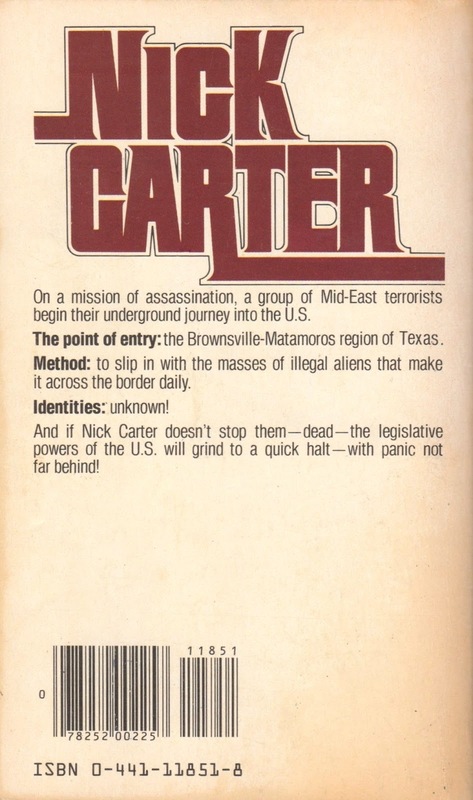 I wrote that one in collaboration with a man named Jack Davis … He was working with Allied Van Lines, and he’d noticed that a lot of the employees were reading books in the Nick Carter series. He told me he thought we could write one. He described the series as “James Bond for truck drivers.” It sounded like fun, so we gave it a try. Much to my surprise, it was accepted, and the editor really liked it. Unfortunately, the editor left the publishing house, and that ended our Nick Carter career. 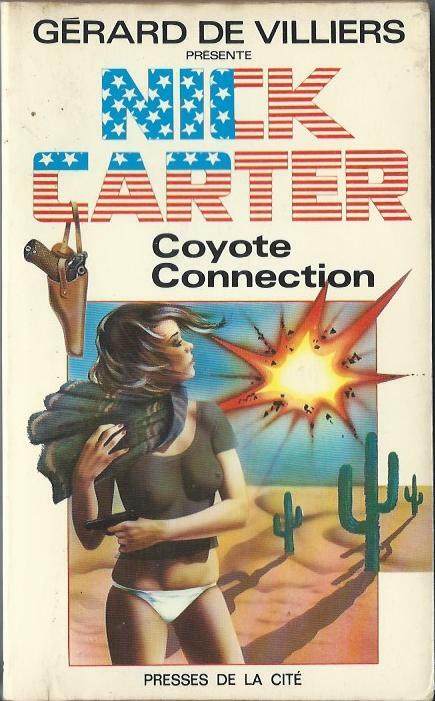 It wasn’t more than two or three years after The Coyote Connection was released, that Crider produced the first of his Sheriff Rhodes novels, Too Late to Die (1986), and sold it to editor Ruth Cavin, who was then with Walker Books. His 25th and final tale in the series, That Old Scoundrel Death, is due out from Minotaur on February 19. As I embark on the second year of “PaperBack” posts, let me promise you many more beautiful and intriguing works to come. But of course, you expected no less. "I was in a writers’ group in Brownwood, Texas, where I was teaching at Howard Payne University, and one of the women in the group couldn’t see to drive at night. She had her husband drive her, and he sat in on the meetings. One night he suggested that he and I collaborate on a Nick Carter novel. The short version of the story is that we did, and we sold the book. 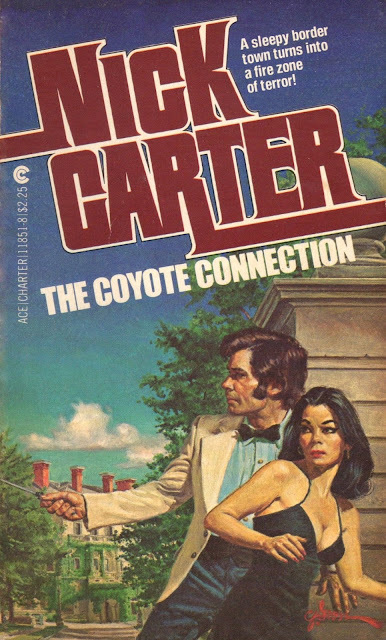 The title is The Coyote Connection [Ace Charter, 1981]. My collaborator was Jack Davis, the brother of Jada Davis, whose One for Hell is a noir classic." I really enjoy this feature. I wish you’d include a paragraph or two discussing the book inside those beautiful covers. I agree with Tom, that would be nice.